The alarm goes off. It might be earlier than a weekday morning, yet I have little trouble getting out of bed. That the sun has been up for a bit certainly helps, along with the realization that there are about a dozen vendors I’ll be seeing shortly who’ve been on the road for hours already. For the fifth year in a row between late spring and early fall, I spend my Saturday mornings volunteering at the Withrow Park Farmers’ Market. As a big city lover and a local food fanatic, spending part of my precious down time in a beautiful park with like-minded people is exactly what I need in order to mentally recalibrate after a tough work week. Having never been the outdoorsy type, preferring urban activity to wilderness adventure, staying in the city most weekends in the summer is a choice I’m very happy to make. The ‘jobs’ are rather easy – help set up the market’s tents and the craft tables. Stop and chat with the other volunteers. Say good morning to the vendors and ask them if they need help. Once that’s done and the market is open, grab a coffee, something to eat, chat with the other volunteers… and repeat. This is the kind of work I wish I could get paid for! 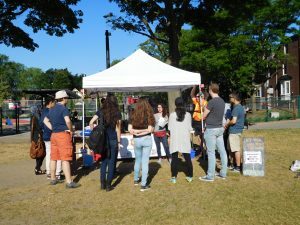 Interestingly enough, most of our volunteers are not actually from the Riverdale community around Withrow Park. I myself have been living in East York for three wonderful years now. Other volunteers are from the Greenwood-Coxwell area, North York, and even Scarborough. Regardless of what area we call home, what most of us have in common is not being born in Toronto. I’m from Montreal and my husband is from Sarnia. Our motivation to join the market was to get involved in our city and to settle down roots in a place we are invested in. For many other volunteers, coming from countries such as Brazil, India and Pakistan, being involved is a way to learn about Toronto, meet people, and gain work experience. I’ve learned about the Ontario growing season and our local produce; the importance of knowing who grows and prepares our food and how hard they work. I’ve made some really great friends and established strong commercial relationships with vendors whom I now rely on beyond the Market season. I’ve been a reference to fellow volunteers. Some are recent immigrants applying for their first job in Canada others are young adults looking for a career change. If those aren’t reasons to get up early every Saturday, then I don’t know what is. Actually, I do – for the market’s baked goods. Definitely. That reason might be the best of them all. – In addition to being a star at putting up tents, Julie Ranger chairs the board of the Centre for Local Food Initiatives. Get early notice of market delights. Our weekly Thursday email will give you advance notice of who and what to expect on the coming Saturday. You can unsubscribe at any time. Wondering what the emails are like? Browse the archive.